A man poses as crying firebrand anti-Islam lawmaker Geert Wilders during a small demonstration outside parliament, rear, in The Hague, Netherlands, March 16, 2017. Dutch voters' rejection of populists in the Netherlands this week gives hope to European centrists as Germany and France head to elections this year with a very real possibility of victories by anti-immigrant nationalists. But there are questions of whether the Netherlands can truly serve as a test for what is to come in Europe. Dutch voters on Wednesday gave a second chance to the centrists, despite a wave of anger over an immigration policy that some believe has allowed the tiny, but influential, nation to become flooded with Muslim newcomers. 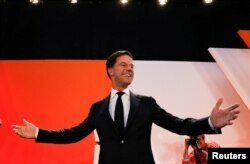 Dutch Prime Minister Mark Rutte celebrated his center-right VVD party's victory in parliamentary elections that won him 33 out of 150 seats, enough to retain control. Rutte praised his supporters for rejecting what he called the "wrong kind of populism." Dutch Prime Minister Mark Rutte of the VVD Liberal party appears before his supporters in The Hague, Netherlands, March 15, 2017. Rutte is poised for a third term. Few expected a victory for the Freedom Party, or PVV, of anti-Islam crusader Geert Wilders. He conceded losing this battle, but not the war he is fighting against a culture he believes oppresses women and gay people. "I would have rather been the largest party in this election. It is a pity that we did not succeed in that . We have to wait until the next election, but we are a party that did not lose," Wilders told supporters after the majority of the votes were counted. Coming in second with control of 20 seats in parliament, Wilders did not win a majority but his party gained five seats in parliament, while the center-right party lost ground overall. Firebrand anti-Islam lawmaker Geert Wilders prepares to cast his vote for the Dutch general election in The Hague, Netherlands, March 15, 2017. "These elections matter in the broader picture because the Netherlands is a founding member of the EU, and it used to be a country that set the benchmark for liberal open governance in Europe," said Angelos Chryssogelos, a teaching fellow in International Relations and Politics at King's College London. The Netherlands is a tiny nation with a population of only 17 million people, but is seen as an economic and cultural giant and a symbol of modern Western liberalism. Europe had reason to be watching the Dutch elections. "They are a big deal because in a sense they are the hors d'oeuvres to the main course, which is the French presidential election, so they come at a critical juncture," Chryssogelos said. Wilders' party's showing may not necessarily mean a defeat for nationalists in France and Germany. France was hit by a wave of terrorist attacks, including ones that killed 137 people in Paris in 2015 and a truck attack in Nice that claimed 86 lives last July. 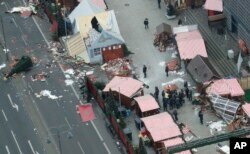 Germany has also suffered much-publicized attacks including one at a Christmas market in Berlin last December that left 12 dead. FILE - German Chancellor Angela Merkel and other government members visit the site of the attack in Berlin, Germany, Dec. 20, 2016, the day after a truck ran into a crowded Christmas market and killed several people. The wave of violence has galvanized support for French right-wing candidate Marine Le Pen and her National Front, while in Germany, Angela Merkel's decision to accept more than one million refugees at the peak of the migrant crisis was blamed for her Christian Democratic Union's losses in elections in her home state last year. Anti-immigrant sentiments have fueled support for the new Alternative fur Deutschland, or ADF, party. Dutch Voters Choose Middle Road, But Will France and Germany Follow? The Dutch experience has been different. In the Netherlands, the election campaign further exposed tensions and anger over the country's rising population of Muslim immigrants. That was a key theme for Wilders, who faced a court battle for inciting hatred after asking supporters at a rally whether they want more or fewer Moroccans in the Netherlands and drawing a resounding response of "Fewer!" But the Netherlands has not been the scene of major terrorist attacks recently, and analysts say that made for a more civil election than Wilders' campaign rhetoric might have suggested. "In general Dutch democracy functioned well; high turnout, clear choices on the ballot and a campaign that was less negative than feared," tweeted Pepijn Bergsen, a Netherlands analyst writing for The Economist Intelligence Unit. Analysts say it may also explain why Dutch voters have, once again, chosen the middle road.